This little beauty right here, should easily accomplish any task required of the outdoor enthusiast, short of chopping down a tree! I do want to mention that the Kingwood handle material is NOT really as red as it appears in this photo - it just seems to be the way my camera wanted to reveal it. It's actually a much richer and deeper reddish-brown. The laminated blade was made from two pieces of 416 stainless steel on either side of a W2 tool steel core. The oxides on the W2, from etching, will erode, to some degree with use and cleaning, but the W2 will acquire a patina all its own and will always reveal the varied appearance of the mating with the 416 stainless. Really nice take-down assembly makes this knife a candidate for a Family Heirloom! This is the second mortised handle knife I've done in a row now, and is the one I used for demo purposes in my "Andersen Forge Reflections" videos. However, in this dark curly walnut, if you didn't KNOW it was a two part handle, I don't even think you would notice it! Those curls disguised the mortise rather well. The blade is hot-blued Random Damascus of 1095 and 15N20. Well, my buddy Lin Rhea made me aware of a process to eliminate those stresses. What you see underneath the domed pins are nearly 1/8" thick stainless "washers" that I made on my lathe that sit in pockets in the handle material and are epoxied in place. When the pins are peened, any stresses they create are dispersed evenly through the stainless washers and none are transferred to the handle material. Yet, we still get full lateral holding strength. I really love that idea and enjoyed using it on this knife. I'm sure it's been used many times, it was just new to me. This knife was a long-time-coming. I made this knife in a tribute my good friend, Larry Bailey, who left the knife world too soon this past year. Larry was a mentor to countless up-coming collectors and makers alike. Larry was a co-founder of the Custom Knife Collectors Association. I chose to use some of the delicious end-grain spalted maple that Larry created during his recent years. This was a time consuming process of literally creating stacks of maple in the woods, cut up into pre-determined sizes, and then sitting back and waiting for them to rot! At just the right time, they were cut up into handle sized pieces, dried, and then sent off for full stabilization. This piece is one of the last two I had from Larry. The single twist blade is made from 1095 and 15N20. Then hot-blued. The entire knife is assembled in a "Frame Handle" type assembly where the blade and frame are two seperate pieces. Could be the center piece of any collection. Thanks, Larry, for your inspiration and friendship. One hard working knife right there! A new knife available from Andersen Forge. This is a handful of a hunter! Designed to handle all the demanding chores in the woods this Fall. A full 5" of W1, forged from 1 1/8" round stock and created with a differential hardening process to reveal the illusive hamon! A truly flawless piece of Kingwood, mated up with stainless steel take-down hardware. Holding it just makes a fella want to cut something! Heavy leather pouch sheath, zippered carrying case and Certificate of Authenticity encluded. A little out of the ordinary creation from Andersen Forge, yet built to meet the high standards I have become known for. As well, this should meet the high demands of the descriminating survivalist. I fully forged this tool steel blade from a 1 1/2" round bar of W2. The heat treatment includes the distinctive hamon which results from the clay process used. Rough-forged finish on the flats and choil, with the beautiful forged-in guard. The handle is recycled tire. Recycled Tire rubber sheets are a durable rubber compound 80% recycled material integrated with high strength synthetic fibers molded from masticated rubber using DISCARDED TIRES! They have excellent compressive strength, hardness, tear resistance and cold flexibility. This used to go down the highway! I forged this beauty from 324 layers of 1084 and 15N20. After completion, the blade was hot-blued along with the mild steel take-down and faceted bolster and finial. The handle is a beautiful piece of Premium Coco Bolo. Quite an heirloom from Andersen Forge. A fun knife to make with Laddered Ws Damascus of 1095 and 15N20. The Damascus Take-down fittings were made from the same bar of Damascus. All parts deeply etched and Hot-blued. A really, really choice piece of Desert Ironwood for the gripper. Another "Lone Star" from Andersen Forge. This is another example of the "Lone Star" style of Damascus manipulation in which I create the 'radial random' fan across the blade of the knife. This was done with a blade of 1095 and 15N20 tool steels, and then hot-blued. The fabulous curly Maple handle then got its own special treatment of Silver Wire Inlay for that extra touch. She will now go live her life, happily, in the Lone Star State - Tejas. Another Mesabi off the line - this one headed to Germany to go on European excursions! I forged this blade from a 1 1/8" round bar of W1 tool steel. When hardening the balde, I utilized a process to create the spectacular hamon so often found in W1 and W2 tool steels. The handle is a piece of greatly curled hard maple that I had dyed brown and stabilized. All put together with my "signature" take-down style using stainless steel fittings. This "Mesabi" will make a fantastic companion. I could do a bunch of unecessary talking and explaining here, or I could just let this knife speak for herself. I had this piece of Fossil Walrus Ivory for three years, and it just sat in its drawer. It was a little short and I had a difficult time trying to decide what to do with it. Then, it came to me in a dream! Make a Short Hunter! But, I had to make something worthy of Fossil Walrus Ivory. So, here is how it ended up. A really nice piece of Damascus which I "upgraded" just a little with a "Crowned" spine. And then hot-blued as well. Oh, and Take-Down, like only Andersen Forge can do. Now living happily in Michigan. She's a simple random steel I made, but then followed this up with what I call "Radial Random" by creating a "sunburst" of lopsided ladders in the blade - which was, of course, then hot-blued. I do not know how many times I have made a knife of Desert Ironwood. Each and every time, there has always been a pin hole, or a crack or some void in a knot or soft spot, etc. But on this knife, the piece of Ironwood I used was absolutely flawless. "Lone Star" was then built in a take-down style. 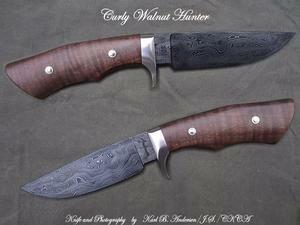 I have a new sheath maker by the name of Scott Teaschner of Cody, Wyoming. His work MUST be seen to be understood. It is so sharp and crisp that I can't even figure it out. He's just good. Really good. This was somewhat of a resurrection of a knife I made some years ago, and was requested by a very astute customer. He preferred a 'hi-lo' guard on his new knife, and the "Chairman" filled the bill. This knife was aptly named by a friend of mine as it reminded him of a cross between a Chute knife and an Airman knife. This blade was forged from large stock W2, and given a clay process heat treatment resulting in a unique hamon. The take-down handle configuration was accomplished with stainless steel fittings and a fabulous piece of Curly Maple that I had dyed when I had it stabilized. Now happily living in New Jersey!